What is emerging in Ramsey County is part of an ongoing national debate around public art, whether it’s Confederate statues in the south or art in the Minnesota State Capitol. The four large vertical murals in chambers shared by the Ramsey County Commission and the St. Paul City Council were installed in 1931. Each mural depicts a scene from St. Paul’s development, from early explorers to an industrialized city. 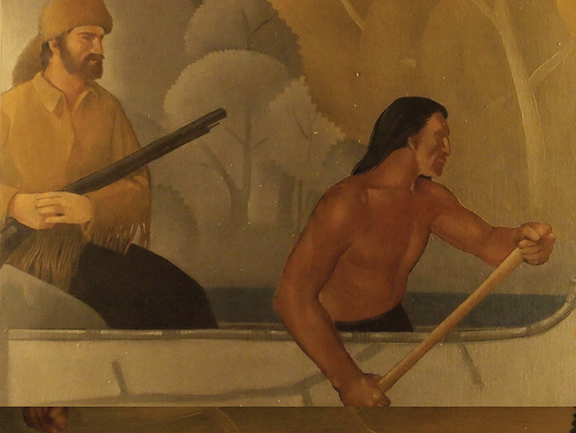 Dominating the top half of each mural is a white man: A voyageur, a surveyor, a river boat captain and an industrial worker. The bottom of each mural has a series of smaller scenes. Women are almost absent from the art. When a scene shows a white man with a person of color, almost without exception the white man is positioned above them in the place of power. For instance, there is a small image of an explorer and a Native man in a canoe; the Indian paddles while the white explorer coasts while cradling a gun. In another image, a priest extends a cross of conversion to two Native men positioned below him. In yet another, a businessman and his wife disembark a train while the African American porter carries their bags. These aren’t welcoming images. Crystal Norcross, a Dakota woman, said she has a hard time making her points in St. Paul City Council meetings because of the murals, and she refuses to take her children into the room. Norcross was one of several panelists, which included: Roberts, Ramsey County Historical Society; John Poupart, founder of the American Indian Policy Center; historian Mary Wingert; St. Paul City Council member Jane Prince; Seitu Jones, a St. Paul visual artist; and Jim McDonough, Ramsey County Board Chair. 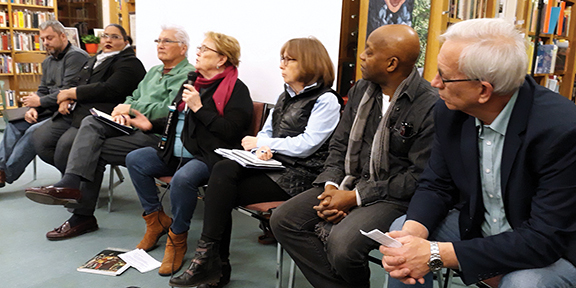 While Wingert began the evening arguing that the murals should be left in place, she ended the evening saying she was convinced they should be moved. Jones said one of his forebearers was born into slavery in the 1840s and later came up river and got a job as a porter at the St. James Hotel. He put himself on the side of the people who believe all the murals should be removed. “The murals help reinforce that attitude,” Jones said. The two elected officials attending the meeting had differing views. County Board Chair McDonough favored the current plan of keeping the historic murals in place and covering two of them at any one time (on a rotating basis). “We can’t hide our history,” he said. City Council member Prince said the mural debate went back at least to the 1970s when Ruby Hunt was on the Council. “These murals have to come down,” Prince said. Approximately 30 people attended the talk. During the audience Q&A one member suggested creating artwork that looked more to the future. Another commented that the artwork made them cringe. A young Dakota woman said when she saw the art she cried. “I still question and wonder why we are so concerned about having one white man’s depiction of history rather than the people in our own community?” she said. The first task force meeting will be February 28th at 3pm and will take place in the Courthouse.